1. Mix up several pitchers of these super-simple cranberry margaritas. They're margaritas, except with cranberry juice instead of lime juice. And the floating cranberry garnishes are easy AF. Here's the recipe. 2. Or if your Thanksgiving group is more into bourbon than tequila, prep a couple batches of this apple cider sangria. When you hand 'em out, tell everyone to "sip slowly." (As if.) Here's the recipe. 3. Shortcut your way to slowly mulled wine with this ruby spice glogg. For this drink, you make tea and mix in booze, so you can enjoy the flavors of spiced wine and actually feel the alcohol at the same time — it also calls for red wine, rum, cognac, and curaçao. Get the recipe here. 4. 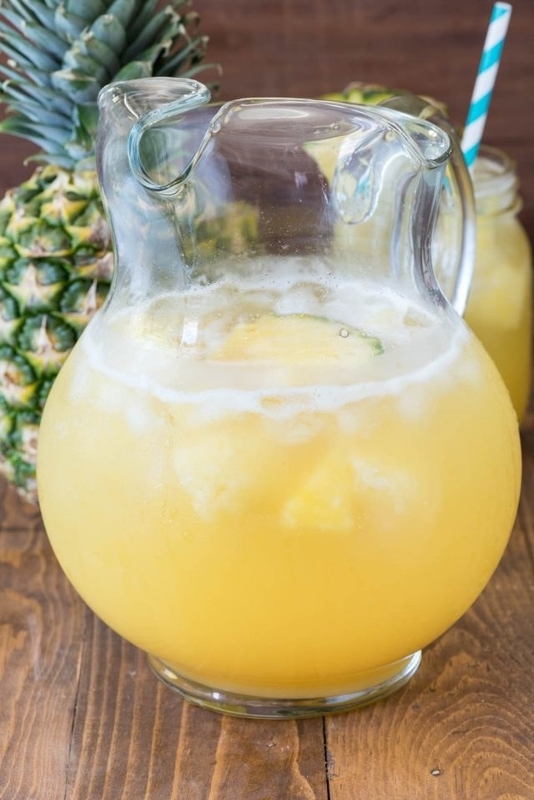 Pretend that you're on a beach somewhere instead of stuck on a couch with relatives by mixing up this sparkling sweet pineapple party punch. 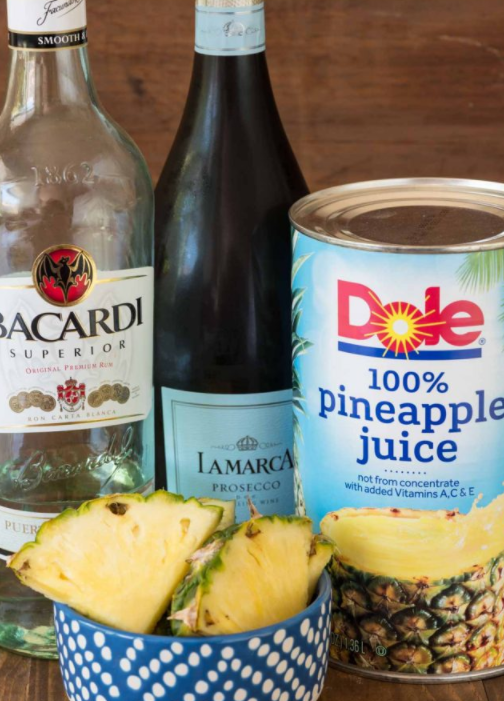 If you wanted to make it taste even more like a piña colada, sub coconut rum (like Malibu or, my favorite, Bacardi Coconut) for the white rum. This also tends to be a picky eater pleaser because it's so sweet. Here's the recipe. 5. Walk around sipping from your personal jar of pumpkin pie moonshine. You'll have to make it at home and bring it with you to dinner. Here's the recipe. 6. If you're cooking, make sure you have a Wild Turkey Bloody Mary close at hand first thing in the morning. It can help everything go much more smoothly. Here's the recipe. 7. Grab a few grapefruit and a hunk of fresh ginger on the last-minute grocery store run to turn into these refreshing grapefruit ginger bourbon sours. ~They say~ ginger has "energizing properties," which could help you magically get everything done before the doorbell starts ringing. Here's the recipe. 8. Sneak a cooler of apple pie shots into the back bedroom and secretly distribute them to your ~cool~ family members. Featuring both Crown Royal and Fireball. (This one's maybe not so "classy," whatever that means.) Here's the recipe. 9. Totter around with the Stuffed Gimlet, bragging about how you've seen enough of food Instagram to know that celery seeds are a thing you can put in drinks. 10. Shake pomegranate syrup with whiskey just before the dessert round begins, as a tart ~palate cleanser~. And maybe it will help you get hungry enough to eat a slice of every pie. Here's the recipe. 11. Sip this apple cider rum punch out of the cinnamon stick like it's a straw. No one will think you're tipsy at all. (This recipe's easily multiplied to make a big batch, if you need to serve more than just yourself.) Here's the recipe. 12. Pull out that punch bowl you haven't touched since you opened it at your wedding shower and fill it with gin, prosecco, and delicious fruit flavors. Just be careful — it's called "punch" for a reason. Here's the recipe. 13. When you're fighting off sleep and that ohmigod I'm so full feeling, but still have a pile of dishes to wash, make yourself a super-easy but decadent Irish coffee. Gotta stay up and get everything done! Here's the recipe. 14. Satisfy your aunt's undying sweet tooth with creamy white Christmas punch. The base recipe for this isn't boozy, so the kids can have some too. That said, this is a post about recipes that will get you drunk, so add a glug of your favorite chocolate liqueur to the adult's glasses before serving. Here's the recipe. 15. Finally make use of that one random bottle of whipped vodka that's been on the bottom shelf of your liquor cabinet since last year to make this super potent, um, "jingle juice." It'll get you cranberry-sauced. Here's the recipe.